I agree...yesterday the lowest low was posted as 8080 for the YM and the low was 8084...and the YM closed up almost 500 pts from there. I haven't looked back too far but for about the last ten 3 day cycles the buy day low to sell day high has always been positive. Based on that alone I would be definitely looking for longs at prices below the buy day lows. New subject...I am convinced for investors now is the time to start accumulating shares. The ProShares Ultra Long (DDM) is down 72% from its high. We are very close to a bottom in this market...in my Very Humble Opinion. Today was a Sell day. It took a while for the lows to come in and they did at or close to the projected lows. After which the rally started. Some day you just don't do things right. I kept on thinking Long, Long, Long! Should have looked at the TTT numbers today and kept in mind TVGR. I would have a lot more money today! Today was a SS day. We did not get higher highs but we still had positive 3 day rallies. However with the gap down at the open and TVGR staying in effect all day it ended up being a big SS day reaching the projected lows. I was doing a little review and research for tomorrow and thought that I would share it with you. It goes with Rich's note (see previous post)for tomorrow and if the opening unfolds tomorrow as he mentions, we should be ready for a good ride. Why? My elliot wave is not the best but I believe this count to be obvious. 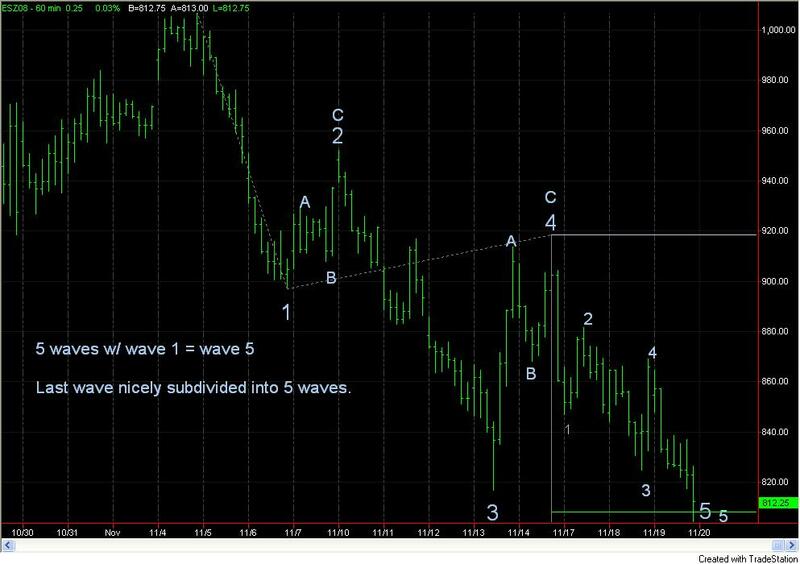 We have had 5 text book waves down, the corrective waves 2 & 4 subdivided into ABC patterns and the last Wave 5 subdivided into a 5 wave impulse wave, which resulted in Wave 1 = Wave 5. (My understanding is it doesn't get much better than this as far as being clear and obvious, yielding good results). So which way? After the 5 waves, a corrective pattern against the last trend ensues in the form of an ABC correction. The pattern should retrace just past the major Wave 4 pivot. Since the TTT numbers are a paid for service I can't release them until later tomorrow, that would be up to Rich. I just wanted to post ahead of time with the analysis, I hate giving after the fact news. Let's watch, and see how well it works with the TTT numbers! One more thing, Wave 5 of the larger Wave 5 will equal Wave 1 of the larger Wave 5 at 797.25. So maybe a little more room to go. I just realized that I referred to the wrong post, I was referring to Rich's email last night. To match the wave count we had a 67% of a lower low and we did. The trade that I made was just prior to the open in the premarket. 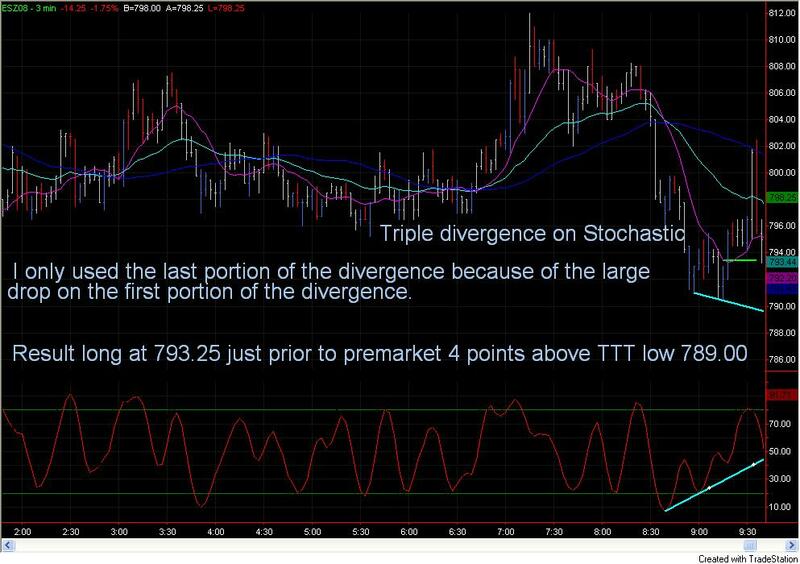 The entry was 4 points above the projected low of 789. My trailer was stopped out but made a little. Hope you did well and sorry for the confusion. Today was a Buy day and we had a 60% chance of making a lower low and did we ever.